When I first started blogging, almost a decade ago, I primarily wrote about fashion—what I saw on the runways, the trends, ways to buy into those trends (usually on the cheap). 50 Fall Trends under $50. Articles that dripped with fast fashion. Even before I blogged, I would pore over fashion magazines. The internet didn’t exist, the runways hadn’t been democratized by instagram and I would have to wait for the latest Vogue to drop to discover what I could expect to filter down to the high street for the coming season. And I cared, I SUPER cared. Then I became part of the industry: marketing tradeshows, attending fashion weeks, producing fashion weeks, reading industry journals and going to presentations on trends that we wouldn’t see in stores for 18 months. The lustre of “trends” started to die for me. Concurrently, I was becoming a known advocate of the made-in-USA movement, local fashion, and ultimately, conscious fashion. So here we are now. Trends in and of themselves are problematic for someone dedicated to shopping consciously. Generally the idea is that a trend is temporary and the garment accommodating that trend therefore disposable. Not very conscious. But what happens to the girl that waited patiently for the September issue every year (the literal one, before it was a documentary)? Well, I still get a pitter patter come fashion week, I still get excited by trends, but now I think about them differently and ask myself one main question: is this so trendy that I couldn’t possibly wear it when the trend dies? 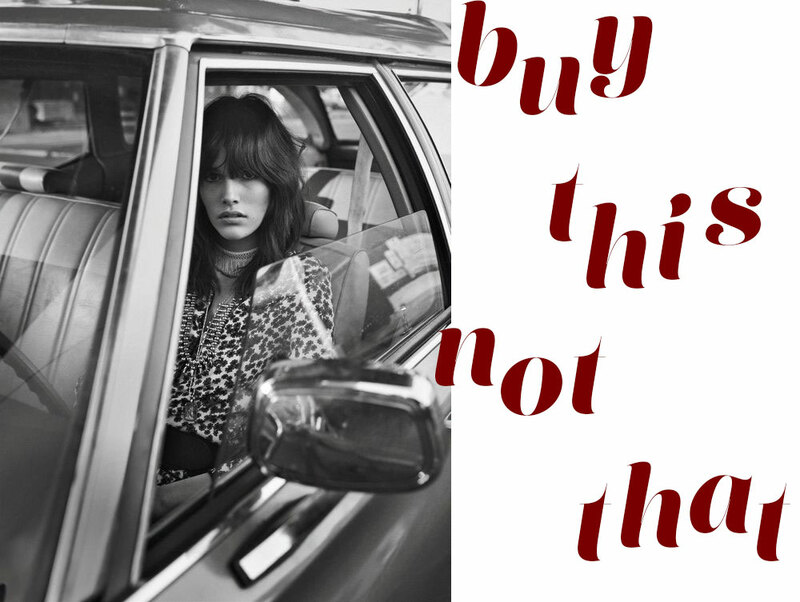 It’s with this question in mind that I put together the first edition of “Buy This Not That”, your conscious guide to shopping the Fall 2016 trends. Enjoy. Neutral is always a good move—and a little blush pink? Don’t see myself ever being mad at it. Own your earthy 60 year-old artist self and you can wear this “trend” for years (it’s my fave and you can call me out on this for decades to come if I don’t). Plaid ain’t ever going out of style; it just happens to be extra on trend this season. So why not invest in some classic plaid pieces that will take you into retirement. The best thing about this “trend” is that it’s heritage, so picking up vintage pieces is easy and an affordable way to shop consciously.